The IM.Echo Report Manager consists of intuitive DLP reports that can be customized for your existing Directory users and groups. IM.Echo provides instant messaging and chat analytics for insight into the amount of time and cost users spend messaging. Audit and Violation reports show content that matches your organization’s DLP policies. The Report Manager allows you to run reports interactively or schedule reports to be automatically generated and distributed. The IM.Echo Report Manager allows you to save reports in a wide variety of file formats for interactive reporting and drill down. Reports can be published to any accessible directory including your organization's intranet so users can easily access reports through their web browser. 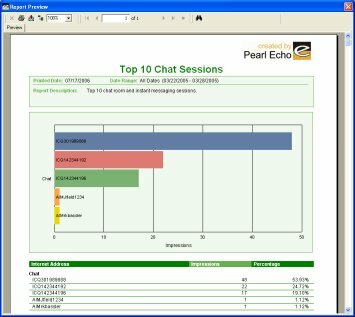 In addition, the Report Manager can distribute reports via e-mail using IM.Echo's built-in email feature.